You can hear an italo disco influence on some of Little Boots' work. Conceived in the '70s, the futuristic electronic sound if italo disco has enjoyed something of a renaissance recently, with its influence being heard on work by artists such as Sally Shapiro, Glass Candy and even Little Boots. 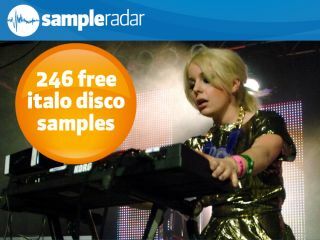 SampleRadar is celebrating italo disco's space-age shtick this week with another collection of royalty-free sounds. The samples are split into four folders, each of which contains a construction kit in a specified tempo. Each kit features bass, beats, percussion and synth loops. The italo disco samples are supplied in a zip file, so you'll need to extract them before you can see them. Enjoy!